The application of knowledge is a key success factor to learning. 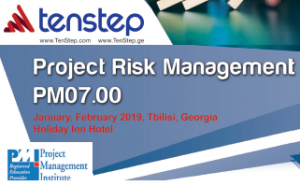 This course goes beyond the traditional project management class by first exposing the students to a rigorous study of the successful TenStep Project Management methodology. The students are then able to demonstrate their knowledge by managing a project from beginning to end with a software-based project simulation package. This approach reinforces the concepts and principles learned for effective project management. As a result, the students are more prepared to apply the methodology to real life situations. The students are graded through a compilation of quizzes and the scores achieved at the conclusion of the project simulation. Upon completion of this course and achieving a passing score, each student will receive the TenStep Project Manager (TSPM) certification. Click here to learn about the TSPM certificate. You can attend this class to receive a TenStep Project Manager (TSPM) certification. This requires that you meet some minimum criteria for experience. Please contact us for more details. Click here to learn about the TSPM certificate. The class contains exercises, quizzes, an eleven part case study and project simulation. Preparation for the PMP® Certification Exam PMONow!